Use a Direct Service: There are 5 companies offering a direct point to point service from Krabi to Koh Samui. All 5 services include bus and ferry transfers all the way from Krabi Town to Koh Samui. Fly: Bangkok Air operates a single daily direct flight from Krabi to Koh Samui. Independent Travel: If you have time to spare you can save money by travelling independently from Krabi to Koh Samui. There are frequent bus and minivan services from Krabi bus station to Surat Thani town . Once you arrive in Surat Thani you can buy a ticket for the 90 minute bus ride to one of Donsak ferry piers and then take one of two cheap but slow car ferry services from Donsak to Koh Samui. Allow at least 7 hours to complete the journey from Krabi to Koh Samui by local bus and inexpensive car ferry. You can book your seats online for any of these direct services from Krabi to Koh Samui by using the search form below. The Lomprayah Company offers the quickest service from Krabi to Koh Samui. 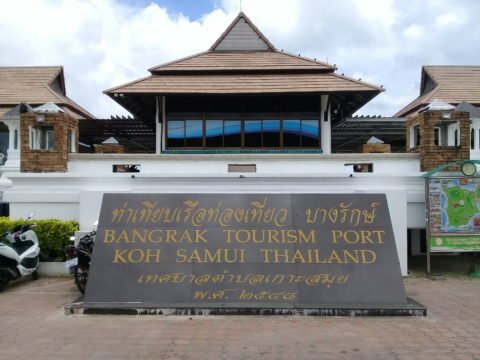 It is at least 3 hours quicker than going by public bus to Surat Thani and from there travelling by bus to Donsak pier for a ferry over to Koh Samui. This service departs from the Lomprayah Office on the Vatchara Road in Krabi Town. This service departs from Soi Seebaramee 1, which is a side road off Soi Maharaj, in the centre of Krabi Town. The Seatran Discovery Office is opposite the Yolk Super Mart. The bus travels to Donsak Seatran ferry pier to connect with the Seatran Discovery ferry to Koh Samui. Phantip Travel has a single service each day from Krabi to Koh Samui. This service depart from the Phantip Travel bus stop outside the Krabi Pearl office on the Utarakit Road, which is in the centre of Krabi Town near to the river. This service departs from the Andaman Wave Master bus station off the Vatchara to the North of Krabi town centre. This service includes a hotel pick up in Krabi. Passengers travel by minivan to connect with the car ferry to Koh Samui. The Lomprayah and Phantip Travel services arrive at Na Thon pier. The Seatran Discovery ferry arrives at Bangrak pier. For information about onward travel from Na Thon pier and Bangrak pier see below. 4 out of 5 of the direct bus and ferry services to Koh Samui terminate Na Thon pier, which is in the centre of Na Thon Town. From Na Thon pier it is easy to find shared pick up truck taxis (songthaew) to most destinations on the island as well as plenty of taxis. The arrival point in Koh Samui for this service is the Seatran pier in Bangrak. Bangrak is near the northern most point of Koh Samui and very close to the airport. On the road in front of the pier you can normally flag down a songthaew shared shaed taxi, although they are less frequent than they are on the main ring around the Island which is 3.3 km from Bangrak Seatran pier. What we recommend is speaking to the staff at the Seatran Discovery office to organise a pre-booked transfer to your final destination in Koh Samui at the point when you check in for your journey. The charge is 150 THB per person to anywhere on the island.